Beginning next month, driver’s licenses in Washington state will be changing. Regular licenses and ID cards will be marked with the words “federal limits apply.” Oregon is going down this path too, but not until mid-2020. After years of resistance, Washington, Oregon and other holdout states are coming in line with stricter federal driver’s license security standards—called REAL ID for short. Washington needs a two-tier system because policymakers previously decided the state will not verify immigration status before issuing a regular driver’s license. Oregon will similarly offer a traditional license and a federally-compliant ID, but for a different reason; so drivers don’t have to bring in a pile of documents to prove identity and citizenship every time they renew. Washington Department of Licensing’s Beau Perschbacher said you’ll need the more expensive REAL ID-compliant license to get into some federal facilities or go through airport security by late 2020. “Some of the less common other areas where you would need a REAL ID-compliant document would be access to certain secure federal facilities like a military base, and finally, access to nuclear power plants,” Perschbacher said. A passport, military ID, or an enhanced driver’s license are alternatives that meet the approval of the federal Homeland Security Department and TSA. Standard driver’s licenses can continue to be used for driving, as identification in business contexts, applying for federal benefits and at post offices, among other uses. Regular Washington state driver’s licenses issued after July 1 will have the “federal limits apply” disclaimer. Regular licenses and ID cards cost $54 and last six years. The state’s current enhanced driver’s license, which costs $78 for six years, complies with federal REAL ID requirements. You must be a U.S. citizen to apply for it. Oregon DMV spokesman David House said Oregon plans to switch to a two-tier driver’s license system in mid-2020 in conjunction with a planned computer upgrade. He said the state’s REAL ID-compliant cards will cost extra, but how much extra has yet to be determined. Oregon DMV offices verify the legal residency status of license applicants. Oregon voters soundly rejected the idea of issuing alternative driver’s licenses and state identification cards to undocumented immigrants in 2014 when the issue was placed on the ballot via a citizen referendum. Both Oregon and Washington state are planning extensive publicity and outreach campaigns to educate people about the most appropriate license options. 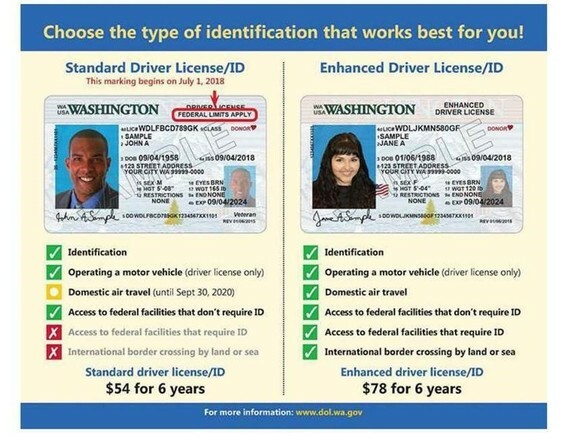 Olympia – Starting July 1, 2018, the Department of Licensing (DOL) will begin marking all standard driver licenses and ID cards with the language, “federal limits apply.” The change aims to bring Washington into compliance with the federal Real ID Act, which requires all states to mark identification documents that do not comply with the federal law. Under Legislation signed (app.leg.wa.gov) by Gov. Jay Inslee, DOL expects to be in full compliance with the REAL ID Act by fall 2018. PORTLAND, Ore. — Portland police acting on a tip discovered 16 people working in a marijuana-processing warehouse that investigators believe to be illegal. Sgt. Chris Burley said Tuesday that documents provided to investigators showed the marijuana was being grown for several patients under the Oregon Medical Marijuana Program. Burley says program guidelines would allow the operation to have up to 30 mature plants. Officers seized 500 plants weighing a total of 3,000 pounds. At least that’s the opinion of his drinks-industry peers, who named the Clyde Common bar manager both America’s Bartender of the Year and the country’s Best Cocktail & Spirits Writer at the 2016 Spirited Awards. Read more below at Oregon Live or check out his web page at jeffreymorgenthaler.com. Portland Bartender Named American Bartender Of The Year!